John Wesley Powell was an American original. He was the last of the nation's great continental explorers and the first of a new breed of public servant: part scientist, part social reformer, part institution builder. His work and life reveal an enduringly valuable way of thinking about land, water, and society as parts of an interconnected whole; he was America's first great bioregional thinker. Seeing Things Whole presents John Wesley Powell in the full diversity of his achievements and interests, bringing together in a single volume writings ranging from his gripping account of exploring the Colorado River through the Grand Canyon to his views on the evolution of civilization, along with the seminal writings in which he sets forth his ideas on western settlement and the allocation and management of western resources. 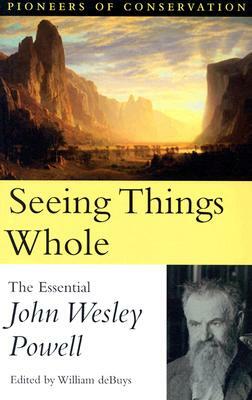 The centerpiece of Seeing Things Whole is a series of selections from the famous 1878 Report on the Lands of the Arid Region and related magazine articles in which Powell further develops the themes of the report. In those, he recommends organizing the Arid Lands into watershed commonwealths governed by resident citizens whose interlocking interests create the checks and balances essential to wise stewardship of the land. This was the central focus of John Wesley Powell's bioregional vision, and it remains a model for governance that many westerners see as a viable solution to the resource management conflicts that continue to bedevil the region. Throughout the collection, award-winning writer and historian William deBuys brilliantly sets the historical context for Powell's work. Section introductions and extensive descriptive notes take the reader through the evolution of John Wesley Powell's interests and ideas from his role as an officer in the Civil War through his critique of Social Darwinism and landmark categorization of Indian languages, to the climatic yet ultimately futile battles he fought to win adoption of his land-use proposals. Seeing Things Whole presents the essence of the extraordinary legacy that John Wesley Powell has left to the American people, and to people everywhere who strive to reconcile the demands of society with the imperatives of the land. William deBuys is a historian, conservationist, and writer based in Santa Fe, New Mexico. He is the author of Salt Dreams: Land and Water in Low-Down California and River of Traps: a Village Life, for which he was a Pulitzer prize finalist. John Wesley Powell (1834 – 1902) was a US soldier, geologist, explorer of the American West, and director of major scientific and cultural institutions. He is famous for the 1869 Powell Geographic Expedition, a three-month river trip down the Green and Colorado rivers that included the first known passage through the Grand Canyon.